We now leave Yangon to explore the upper reaches of the legendary Irrawaddy River. 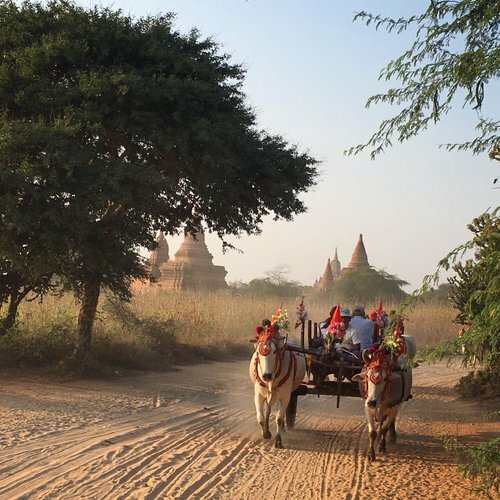 Come with me as we make our way down from Bhamo to Bagan by river boat. Biker girls on the streets of Bhamo, in Kachin State, only about 40 miles from the Chinese border. 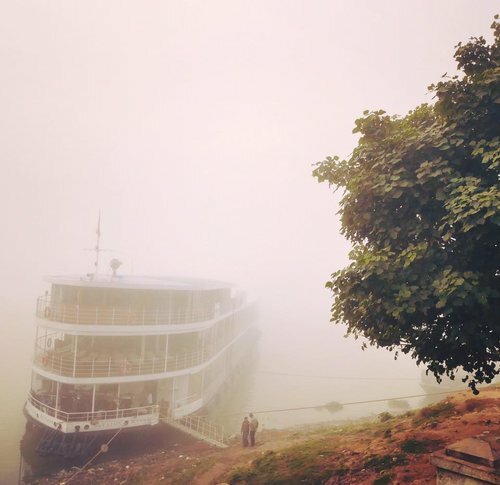 It’s the starting point of a new Avalon river cruise on the upper Irrawaddy. Bhamo, in Kachin state, is where local travelers catching the ferries south begin the four-day journey on the Irrawaddy river to Yangon. It was always an important trading point; Marco Polo came through here. And here begins our road to Mandalay. The banks of the Irrawaddy river are studded with gilded Buddhist stupas. Almost every village has one or more. I’m watching the panoply from the deck of an 18-cabin boat. Avalon Waterways is currently the only river cruise company with an itinerary on the remote upper stretch of the Irrawaddy. 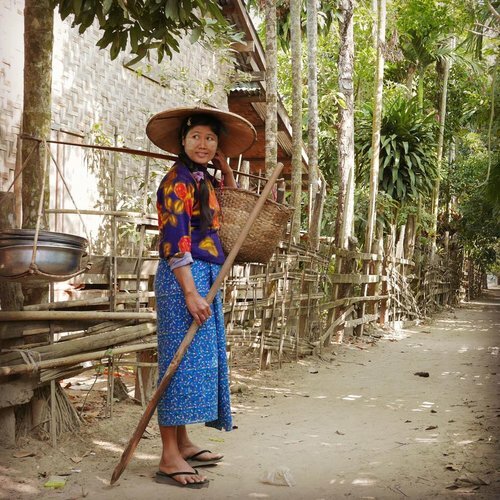 Woman with laundry on Kyun Daw, an island village on the upper Irrawaddy. Balancing act: This woman is a lesson in how to carry bulky stuff gracefully. On Kyun Daw, an island village on the upper Irrawaddy. 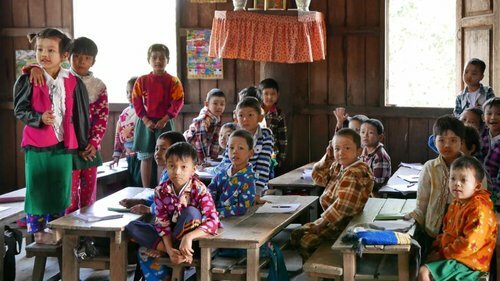 Cute overload: One-room schoolhouse on the island of Kyun Daw, on the upper Irrawaddy. The river cruise company makes a donation and brings supplies on visits. The Avalon Myanmar, docked at Katha, Sagaing, Burma. The boat’s design is based on the famed Irrawaddy Flotilla Company steamers that plied these waters during the British raj. 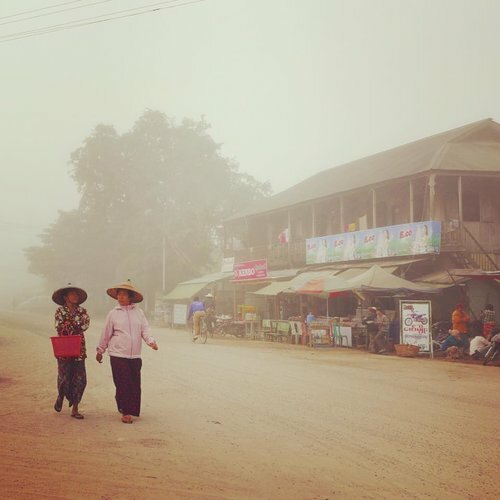 Misty morning in Katha, Sagaing District. A riot of colors and sartorial sensibilities at Katha’s market. Sagaing District. 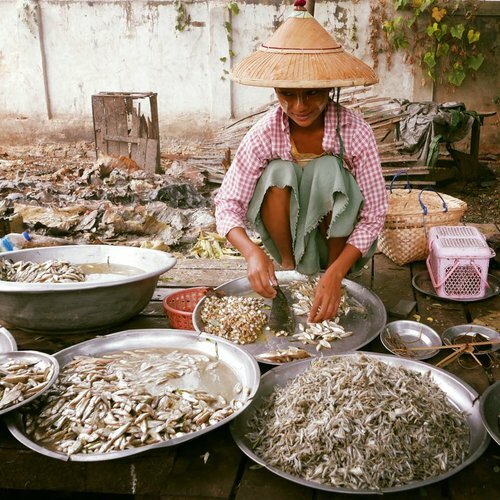 A woman at the Katha wet market cuts small fish into even smaller pieces. Sagaing District. Before 1984: The British writer George Orwell lived in this house in Katha in the ‘20s, a minor factotum in a dusty colonial outpost. Later, he wrote his first novel, Burmese Days, a harsh portrayal of colonial society. His publisher deemed the story potentially libelous, the characters perhaps too real and identifiable, and so it was published first in the U.S. Elephants on parade: This is the nursery and resting area for a working elephant timber camp near Katha, Sagaing Province. As teak has become scarce, and protection for what is left grown, it is experimenting with tourism, having partnered with with Avalon, which has provided training, support, and guests. Women filtering out impurities from black sesame seeds. Kyar Nyat, Mandalay division. Kids. Children, many women, and some men apply a paste on their faces made of powdered bark. Called thanaka, it’s used for both sun protection and decoration. Kya Hnyat, Mandalay province. 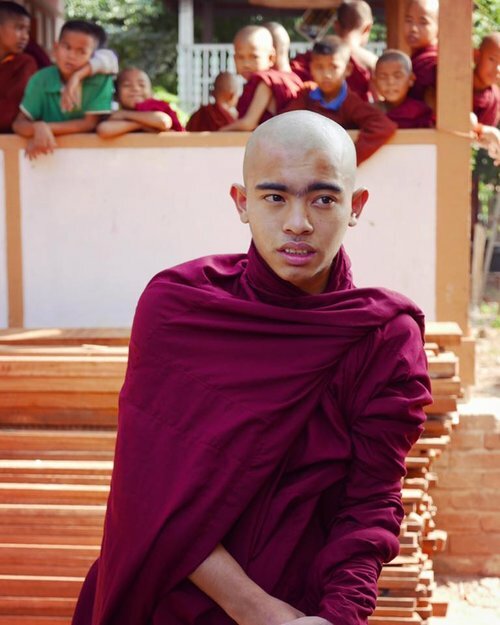 While a serious young monk demonstrates the various ways to wear a robe, really young monks and novitiates jostle and giggle in the background. At a monastery in Kya Hnyat, Mandalay. Young monks at a monastery. Kay Hnyat, Mandalay. 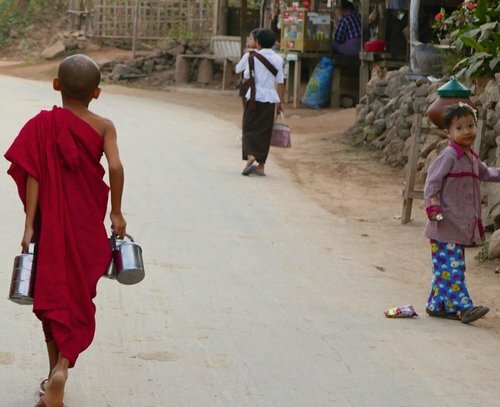 A young monk, a uniformed schoolgirl, and a playing child on the streets of Kyauk Myaung, a town along the Irrawaddy river known for its pottery. Families donate containers of food to the monks as alms, and the monks return the empties at the end of the day. The riverside town of Kyauk Myaung has been making pottery for centuries, the most famous being the so-called Ali Baba jars. These 50-gallon pots (pictured, upper corner) transported liquor, fish sauce, oil, etc., and played an important role in the maritime trade during colonial times. This boy’s friends, standing nearby, were ribbing him for being photographed and it was sending him into peals of laughter. Kyauk Myaung. 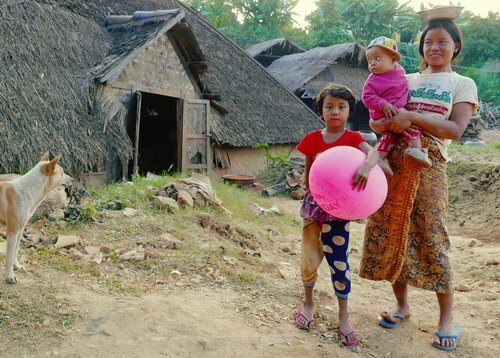 Mom and kids outside their home, Kyauk Myaung. The ingredients needed to make tea leaf salad, a traditional Myanmar recipe eaten as a snack or side dish. It’s the yummiest thing. Mahamuni Temple, in Mandalay. The Buddha statue is said to be one of only five cast during the historical Buddha’s lifetime. If so, Lord Buddha was a giant who looked like the Michelin man. Men (women aren’t allowed) press thin layers of gold leaf onto the statue to gain merit in the next life, causing a lumpy appearance. Indoor market stall next to Mahamuni Temple, Mandalay. 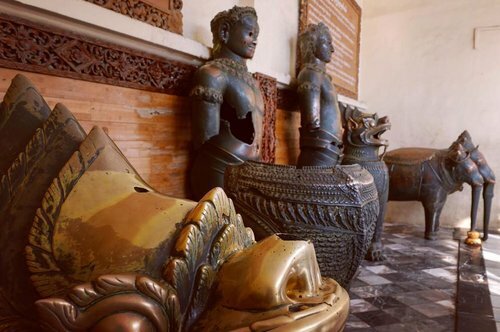 These figures, in a hall off the Mahamuni Temple, were plunder from Angkor Wat, brought to the lost city of Arakan (in western Myanmar), and then carried off by Bodawpaya’s army and brought here to Amarapura, capital of the Konbaung, on the outskirts of Mandalay. 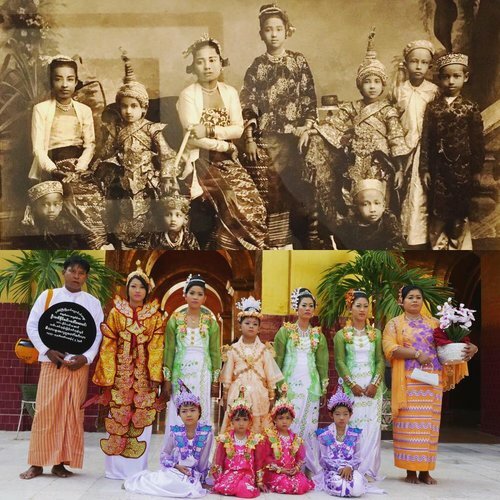 Then and now: Courtiers during the Burmese reign, before the kingdom was defeated by the British in the late 1800s. Today, Burmese families dress their kids up royally before they enter the monastery or the nunnery (often temporarily). Mahamuni Temple, Mandalay. Novitiates about to enter a nunnery or monastery. Their proud families dress them up in finery in imitation of the Buddha’s journey from riches to renunciation of worldly possessions. Being a Buddhist monk or nun is not necessarily a lifelong commitment. Often it is just a stint. At Mahumuni Temple, Mandalay. Burmese beauty. Mahamuni Temple, Mandalay. U Bein’s Bridge, in Amarapura, on the outskirts of Mandalay, built in the 1800s using timber from Inwa, the old capital. It’s the longest teak walkway in the world, over 1 kilometer. One needs a Buddhist’s sense of calm when walking over, as it is narrow, rickety, the space between the slats wide, and there are no railings. For sale at the outdoor stalls near U Bein’s Bridge, Amarapura, near Mandalay. Sunset view from a boat of U Bein’s Bridge, in Amarapura. Tourists, villagers, and monks go across it. 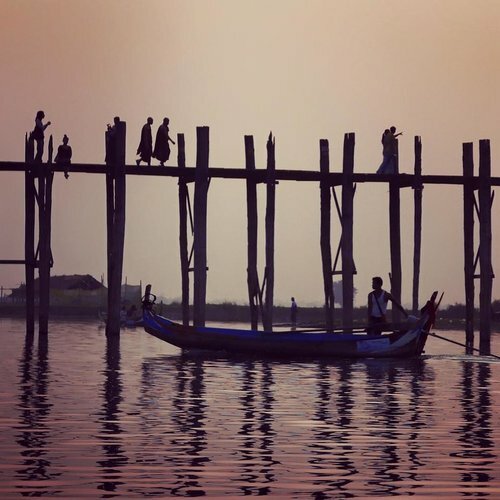 It’s the longest teak walkway in the world, built in the 19th century. Burmese puppetry, a complex traditional art form perfected at the Konbaung royal court. 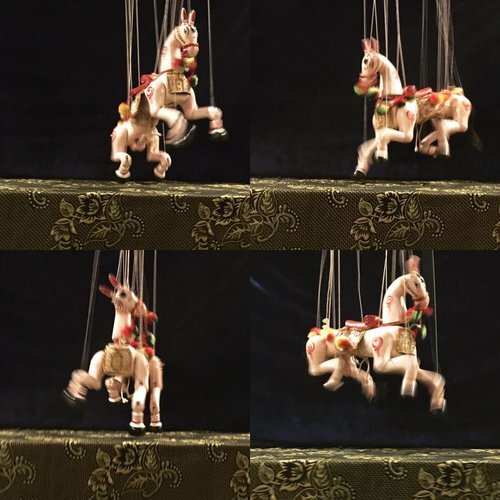 Marionettes are sold at markets and stalls and make nice souvenirs. Mandalay. Ghostly stupas as far as the eye can see. This is the splendor of Bagan, especially at sunrise and sunset. Some 2,000 shrines, monuments, monasteries, and stupas dot this area called the Bagan Archaeological Zone. They’re what’s left of an imperial capital that held sway during the 11th to 13th centuries. Hot-air balloons are a popular way to see the spectacle. Fancy a slice of watermelon? A seller near the entrance to the Ananda Temple, Bagan. 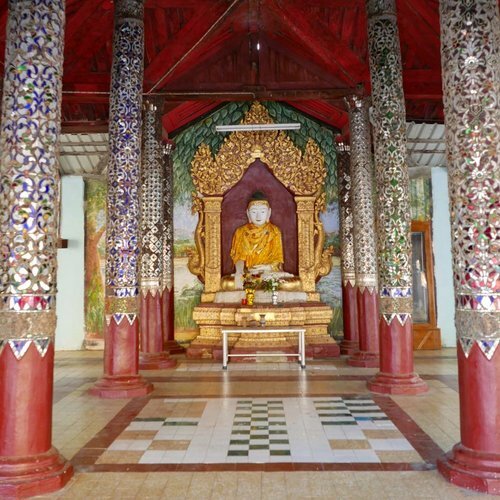 One of the many opulent halls of the Shwezigon Pagoda, built by the founder of the Bagan Empire in the 11th century. The main stupa, an enormous gilded wonder, encases a bone and tooth of the Buddha (or so the story goes). Bagan. Grinning leogryphs, stone guardians of the Ananda Temple, Bagan. 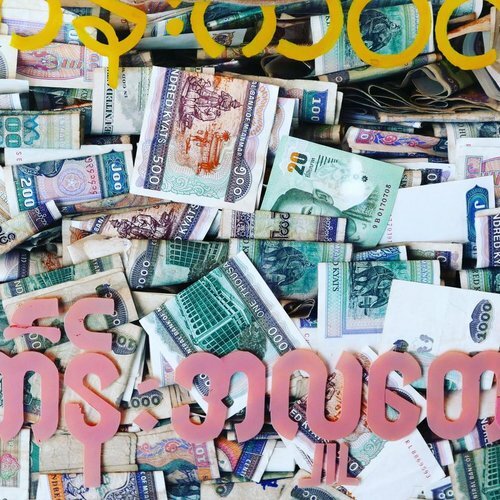 A Burma birthday: A thousand thanks for your wishes from around the world. It was a most excellent day, starting in Bagan and ending in Yangon. I am grateful to have been pampered by friends old and new. Super special shoutout to Natasha and Melanie, both of whom fed, housed, and provided cake and dinner. Mod men of Mandalay. 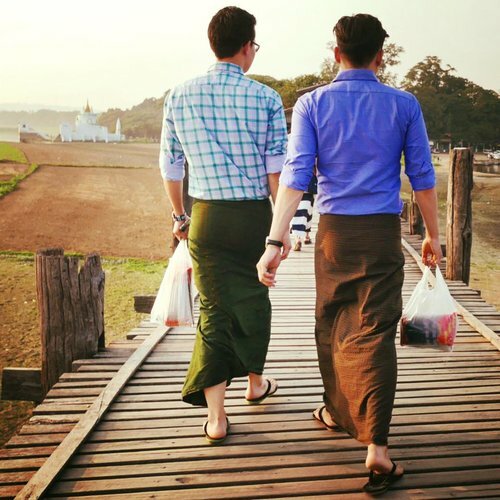 Many locals fuse Western and Eastern dress, but I thought these two carried it off with extra panache. A gigantic and glittering standing Buddha, one of four, at the Ananda Temple in Bagan. This one is original from about the 12th century. How does one of the poorest countries in the world pay for the upkeep of thousands upon thousands of shrines and stupas, temples and pagodas? In part it is the Buddhist worldview, practiced by some 90 percent of the population, that holds that good works, donations, and “right action” in this life will give one a better station in the next reincarnation. Therefore glass donation boxes, often unattended and barely secured, are usually full of money. Bagan. Myanmar is such a rich cultural treasure right now in part because it has been isolated for 50 years. The opening to the West brings in desperately needed freedoms, democratic models, economic opportunities, and modern communications. But it also risks ushering in consumerism, a corruption of positive Eastern values, and abandonment of unique cultural traditions. Unchecked tourism growth, while bringing in money, can overwhelm fragile sites and communities. We’ve seen this happen again and again in so many parts of the world. 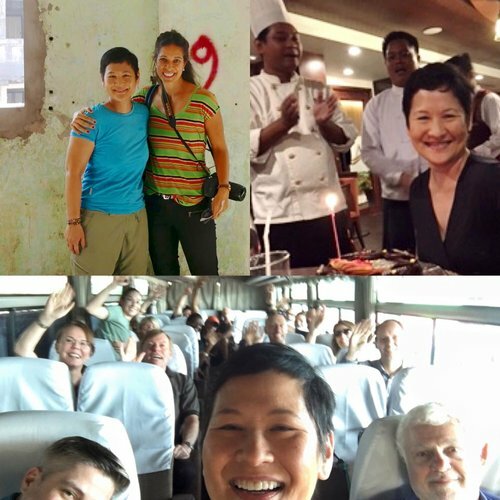 My birthday wish for Burma is to avoid these pitfalls and grow its tourism purposefully and with a long-term vision. Friends Chris and Natasha and Derek are working with the government in Burma with that goal in mind. Travel companies have an obligation to put best practices in place and educate their clients. I’ve traveled with one such company in the last week, Avalon Waterways (kudos Patrick and Melanie); there are other good outfitters doing their part. Photos © Norie Quintos. This is the second of a two-part series. To see the first, click here.